← Explore local sites with Shelley Brinn! It’s not every day that one can confront and conquer their own inner monster. Imagine a murder mystery. You are the detective and the enemy is your own body fighting to be healthy after 30-years of a chronic skin condition like “red-flaky Psoriasis.” Can you find your own cure for something as wicked as the “heartbreak of Psoriasis” without the drug-based intervention of our “god-like” western doctors? This is my personal journey about acute Psoriasis, covering 80% of my skin for over 25 years. 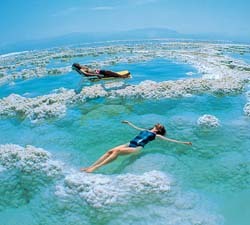 I have thrice cleared this dis-eased state with the amazing minerals in our soothing Dead Sea of Israel. I’m a new man, ready to embrace each successive day of life with a positive mental attitude and accepting G-d’s blessings from above… You can too! Is there a direct way out from the shame of having acute Psoriasis? With proper diet, Dead Sea treatments and unique sunshine, I’ve returned home to reclaim the sanity of my youthful clear “baby” skin! 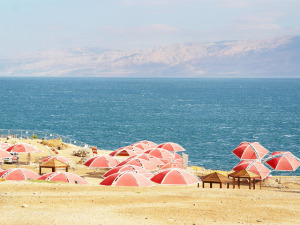 At the Dead Sea patients come yearly to experience short-term healing, lasting 4-6 months of wonderful relief. Each time I go for 3-weeks or more, my skin goes into a smooth remission for about 4-6 months. Join me down a wonderful lookout onto a sunrise of salty sea known as YamaMelech to Israelis. It means, “Great Salty Sea,” not Dead Sea. Why “Dead” you may ask? Could life exist in these salty waters with temperatures averaging over 75 degrees Fahrenheit year-round? ABSOLUTELY! Scientists detect microbial creatures and small fish in undercurrent streams. So why has “Death” been associated with YamaMelech? Perhaps, original map-makers heard stories Caesar’s army arrived by archaeological findings. It’s believed that his soldiers drank the waters and died. 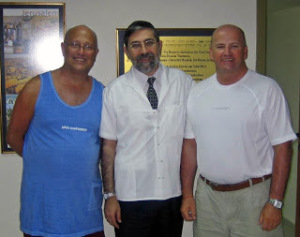 Go to our website at www.HealthRightISRAEL.com to learn more! “We have the right to live healthy and productive lives everywhere on Earth!” – author of Dead Sea, Keep it Alive!